If you are reading about stationery products online, then I am sure you have heard about Bullet journaling, or #bujo, on social media. It's a new, big thing and many people are spending huge amounts of time making elaborate and beautifully artistic spreads and sharing them online. But the essence of Bullet Journalling is much less artistic and more practically focused than the often intimidating art work would suggest. And one of the tools to make Bullet Journalling successful is Leuchtturm1917's Bullet Journal notebook. Before I talk about the notebook, I want to introduce the foundations of the Bullet Journalling system. Bullet Journalling was developed by Ryder Carroll as a system of rapid logging your notes, tasks, appointments and events rapidly in a trusted system. Bullet Journalling differs from day planner style organizers in its simplicity and lack of a constrained format. In fact, Bullet Journalling works best using plain, numbered pages. The essence of Bullet Journalling is to break down the things you need to do into collections of thoughts organized in a place that you can easily find them. Though the practice of regular reflection, a bullet journal user can be incredibly organized and also highly focused on achieving his or her highest priority goals. The Bullet Journal system uses several key collections or places to store similar information to allow you to quickly jot down your tasks and notes (rapid logging) in a useful list format that may frequently be reviewed. Index - allows for quick access to the numbered page that contains the information you are looking for. Pages can be non-sequential, and the index and number pages are significant benefits of Leuchtturm1917’s Bullet Journal. Future log - a collection of pages to record future events and tasks by month. Someday log - this is a typical collection to set up to track all of the things that you would like to do, but haven't decided when, or assigned a particular date too. These can also be your big dream goals; your list of would like to dos. Monthly log - a collection of calendar dates and area to list important activities for the current month to allow you to schedule important events on the day you need. Daily log - a collection of your notes, events, appointments, and tasks for each day, usually compiled during your nightly reflection. The process to create a Bullet Journal system is quite simple. Set up your collections and brain dump all of your open loops, or unfinished tasks, into the appropriate collection. The best practice is to reflect on your bullet journal twice per day, once at night to close the tasks you have completed each day and transfer any unfinished and still important tasks to the next day, and once in the morning to ensure that you plan your day to meet your objectives for the day. This process is called migrating and is surprisingly effective at helping you prioritize your to do lists. A circle is an event bullet, which are date related events, such as birthdays, anniversaries or other dates to remember. An upwards arrow (the top two sides of a triangle) are an appointment bullet. During your reflection process, each of these bullets will be modified to reflect your activity and to ensure nothing gets missed. If you migrate this task until another day, you convert the dot to a right facing arrow and add it to your next daily log entry. If you schedule this for a day in the future, you turn the bullet into a left facing arrow and add the entry to your monthly or future log as appropriate. You add a line to the bottom of the triangle of an appointment bullet to show completed appointments. You can also develop personal bullets to meet your needs. Search for bujo layouts on any social media platform, and you will find lots of wondrous choices. I began my bujo quite simply, but have added a couple of different formats to enhance my effectiveness. I use a grid format for my monthly planner that allows me to break my day into morning, afternoon and evening. I find that this gives me a more efficient way of scanning my schedule to keep organized. I also developed a daily behavioural tracker, using techniques in Marshall Goldsmith’s book Triggers to help me make positive changes in my life. You can be as creative or minimalist as you prefer! The advantage of using a Bullet Journal system is that each entry you make will be easily tracked through the reflection and migration process to ensure that you close any open loops that you have open and that you complete the most important activities. These are the basis of the Getting Things Done system. The GTD system developed by David Allen in the 90’s and is as effective today as it was when introduced, even though our worlds are much more digital and complex. The GTD methodology is to put all of your open loops (tasks, notes, and activities) in a trusted system and review them on a regular basis. The Bullet Journal is very good at putting the GTD methodology into practice in a convenient and thought provoking way. If you are interested in personal organizational systems, I highly recommend reading this book. The Bullet Journal system is very simple yet immensely powerful. Ryder Carroll recorded a short and straightforward explainer video that I recommend you watch if you are interested in the system. I also recommend listening to the recent Pen Addict interview with Ryder Carroll on the relay.fm website. Leuchtturm1917 partnered with Ryder Carroll to develop the official Bullet Journal. This journal is an A5 sized journal, similar to Leuchtturm’s regular A5 notebooks, but they added BulletJournal specific resources to help you learn Bullet Journaling. Since the original limited edition Kickstarter project, this journal has been added to Leuchtturm’s regular line up and is now available in different colours. The Leuchtturm1917 Bullet Journal is a well constructed A5 dot gridded journal. It contains 248 pages, a thread bound hard cover to allow it to open flat, and three different coloured fabric bookmarks, which are very practical to refer to commonly used collections. The Bujo is currently available in black and green covers, and there have been hints at new colours down the line. 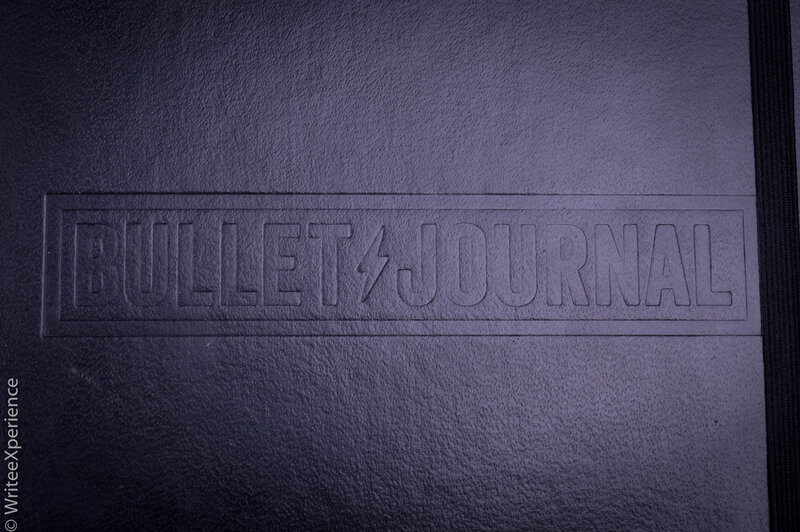 “Bullet Journal” is embossed on the front. The inside of the front cover lists a quick reference of bullets and space to write down your own creations, while the inside of the back cover contains a standard gusseted pocket for your loose paper. 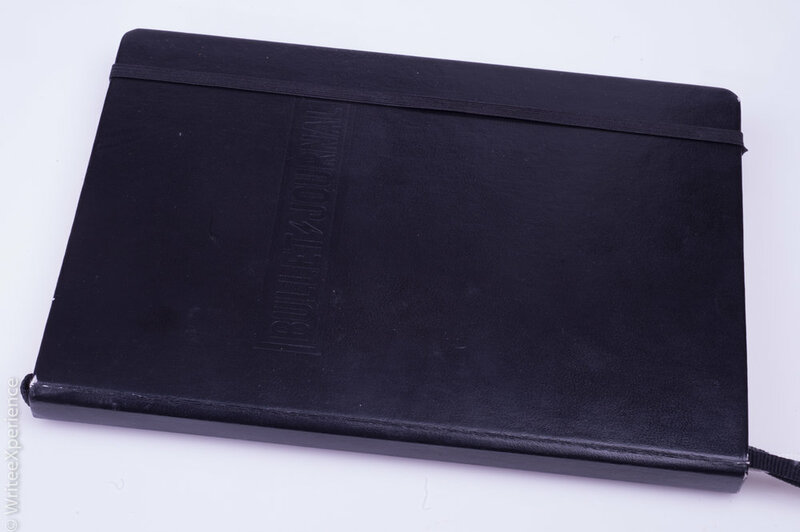 The notebook is secured closed by wrapping an elastic strap around the book. Each book also comes with a sheet of stickers for archival purposes. These include spaces for name and from- and to- dates. The paper is Leuchtturm’s standard dot grid, 80 gsm paper. It is a good paper, with a little tooth (feedback) when writing. The paper is less smooth than other fountain pen focused products, such as Rhodia or Clairefontaine; however, I do like this paper better. I use a variety of pens and sometimes pencils, though my daily writer is my Lamy 2000 fountain pen. All writing tools feel very good on this paper, where other notebooks may be a little too slippery with some pens and paper. Leuchtturm market the paper as ink proof, and I will mostly agree. There is some show through, but it is acceptable. I would not use wide nibs with wet inks, as I feel that the bleed through could be distracting. But for daily use, the paper is very good. I find the pages encourage quick drying of inks and have had no problems with smudging. I also find the dot grid pattern to be a lighter grey coloured dot than other popular products, such as the Rhodia Webnotebook. I like this feature a lot, as the dots become a guide, rather than a visual distraction. The Bullet Journal is largely the same as Leuchtturm’s other A5 dot grid books. Added Bullet Journal content includes four pages of indexes (rather than the usual two) and four pages titled *future log*. Leuchtturm has added eight pages of bullet journal instructions are at the back of the notebook, and a quick reference guide to bullets and useful tips page start the book. Also, the extra bookmark (to a total of three) is handy. Leuchtturm is beginning to do an excellent job of penetrating the local Canadian market. Notebooks are available in Chapters / Indigo stores, though at the highest price around town ($33). At Nikaido in Steveston, they are $30 and at Paper Ya on Granville Island, $29. They are a few dollars more than a regular Leuchtturm notebook, but worth it, especially for your first bullet journal, as the resources will be helpful until the process becomes second nature. I have used a GTD organization system for over 15 years in various forms, and it has been highly effective for me. I have used many manual and digital tools and processes, and each one has had advantages and disadvantages. I converted a Filofax planner to a bullet journal system a couple of years ago and found the bujo system worked well and complimented my digital needs. Rapid logging, migration, and reflection are part of the GTD philosophy. Indexing is also crucial to Bullet Journalling and particularly important in a simple notebook such as Leuchtturm’s. I purchased this Bullet Journal at the beginning of the year and have used it daily since. It is both a notebook and organizational system designed to keep you organized in the least amount of time while reducing your stress level of forgotten tasks. As you can tell, I feel this is a great product, even though not necessarily required to start your own bujo system. I was surprised this summer when my teenage daughter asked for a bullet journal to help her organization in high school. Hers will be much more artistic than my more minimalist and functional version, but this flexibility is the advantage of the bujo system.